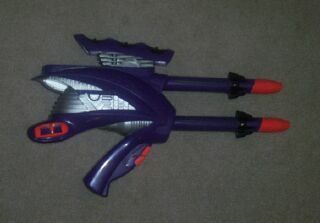 Welcome to my Non-Nerf weapons page, where other generic dart blasters of similar size, performance, and looks to that of Nerf guns are displayed. The more often used guns of today are listed at the top, and then the rest which do not really pertain to wars of today are listed farther down the page. The Maxshot has become a standard in Foam weaponry in recent yeaars. It is the most powerful relatively new springer on the market. Single barreled, they are quite deadly, and many have found that they can either attach an Airtech 2000 turret to the front of theirs for a four-dart rotating assembly, or they can make their own six-shot turrets with CPVC or PETG for even more darts at the ready. A six-shot revolver maxshot is basically the spring equivalent of an Airtech 3000. It can be fired at basically the same speed, though it can be a tiny bit slower. If youc an find a maxshot, it would definitely be a good way to go. When modded coorrectly, the Uruk-Hai crossbow, though not very accurate, can be a very powerful single-shot weapon. The stock crossbow uses surgical tubing on the interior of the gun rather than a spring to propel its plunger forward. This tubing can eventually dry out, crack, and break, but all it takes is a few bungee cords wrapped around the back end of the gun and it works great. Many "tree-bow" users have bungees on their guns even if the silicone tubing hasn't cracked. Though not as accurate as a Nerf Crossbow, Tree-bows still pack just as good of a punch. The Ultimator is quite an old weapon. You rarely see them anywhere anymore, and I've never even heard of one being used at a larger war. They just take too darn long to prime. They take forever. Chances are, you won't be able to find one today, but you don't need to. Just go buy a titan instead. The Vortex Tornado is incredibly accurate, but all you have to do is walk outside, and you couldn't hit the broadside of a barn. The Rubber Vortex rings that it shoots could be deflected if you target were to sneeze. Even the slightest breeze will blow them off course. The rings for these are next to impossible to find on the market today, but the guns and their ammunition can occasionally be found on ebay. 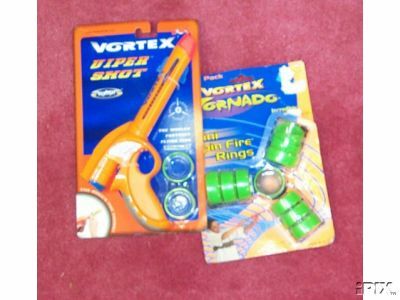 See the Vortex Tornado review, and add a second barrel, semi-large pistol sized, and the capability to fire one large and one small vortex ring on each barrel, at once, for a total of four rings. A small, less powerful pistol-sized version of the vortex tornado. Shoots the smaller rings mentioned above. A poor version of the Vortex X2. It is a small pistol that is somewhat awkward to use, so don't try using it for a war unless you really have to. They are, like the rest of the Vortex line, really just novelty guns, though the tornado is still a superb gun for indoor wars. Another one of those guns that light up their darts so they glow. I don't know if there is a flash when you fire, but don't buy one to find out. They shoot doarts that nothing else does, with what appears to be poor range. They seemed kinda cool, but I don't really know. Unlike the Nerf Crossbow, this is an actuial real crossbow, that uses the bows flexing power and a string to launch projectiles. I've heard that they get pretty good ranges, but few people use them because of their ammo type. They are red plastic darts will vanes to keep them steady, but these crossbows can really shoot just about anything you stick in them. They've been on shelves for years at Sport Chalet and Big 5, among other Sporting Goods stores. It shoots the same darts as the Barnett Crossbow above, but because it has a set barrel size, it cannot fire other nerf Ammo types. Don't bother. Just make your own nerf blowgun. They work far better. It has eight barrels, and it has a plunger. That is all that I know. Nobody in the Nerf Internet Community that I'm aware of has purchased one of these, because it has a $30 price tag. For a tiny pistol that's not even Nerf. 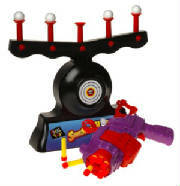 It's expensive because the target that comes with it plugs in and uses air to make those white balls float as targets. I wouldn't test your luck and buy one. Still, if you want to, they're on Amazon.com.